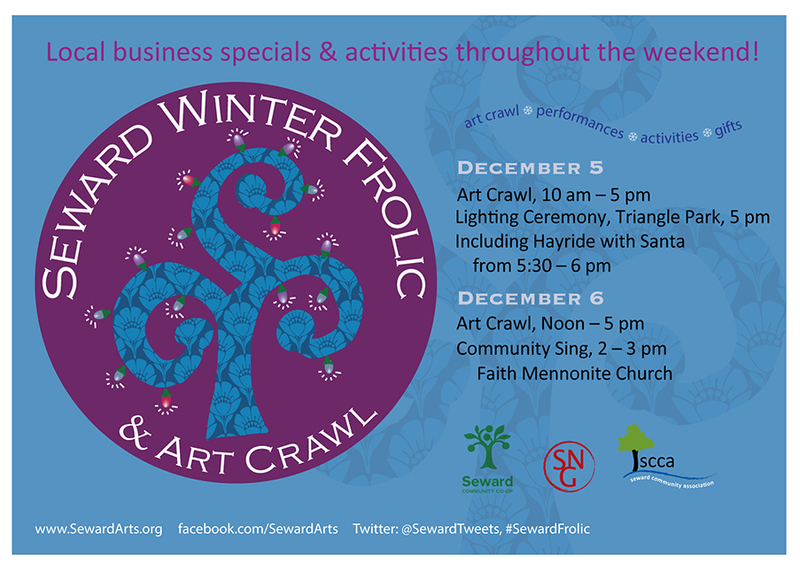 The Seward Winter Frolic is a FREE weekend art crawl in the Seward neighborhood that takes place December 5th and 6th, with a special Kick-Off December 4th. Join us for three days of culture, art, performance, music, food, beverage, and delight! Art Crawl events are FREE and enjoy specials offered by local businesses and artists! Check out the Frolic MAP for 2015 and find your favorite artists and businesses with descriptions. For the Frolic schedule, activities, and events check out the Seward Winter Frolic Brochure! The Seward Art Crawl is one of many events during the Seward Winter Frolic & Art Crawl All day long businesses will be offering specials and local artists will display their work at several venues. At 5pm on Saturday, shoppers, residents, and businesses are invited to gather in Triangle Park (26th Ave. & E. Franklin Ave.) to light up the park, creating a symbol of our warm community spirit during the cold days of winter.